I greeted Wiglaf with a feeling of familiarity. However, a bit of research revealed that this wasn’t through the Listener page, but pretty much everywhere else. 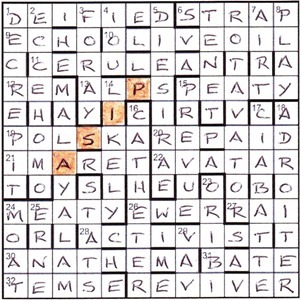 Indeed, the one and only Listener was over fifteen years ago and was his/her first published puzzle. This week, we had wordplay leading to an extra letter which would reveal a “failed attempt (owing to an incorrect name)”. That sounded odd. Definitional clues were to entries with the same thematic property. I ignored the definitional clues, mainly because they lacked entry lengths. I moved on to the across clues and was immediately rewarded with 6 STRAP, 9 ECHO and 12 REM then a bit of a gap to 21 IMARET, 22 AVATAR and 27 RAI. Sadly, that was it, with even the simple hidden at 32 Local’s to sift through items exchanged (5) for TEMSE passing me by at this stage (via trying to work out an anagram of ‘ITEMS’). 2dn ECCE HOMO then 4 Promise to be 20 Native Americans short (3) IOU (despite not having solved 20), 5 DIES IRAE and 7 AIRT got the top of the grid going nicely. This enabled me to get 10ac A fat cartoon character by the sound of it (8, two words), not GARFIELD but OLIVE OIL that hapless girlfriend of Popeye. The unclued entry in column 10 (damn the lack of a number) was now RO····T·R and looked as though it might tie in with the definition clue e Soil-tilling machine to give ROTAVATOR, a nice palindrome. Could that be the theme? Yup, 1ac was DE···I·D and led to DEIFIED for clue c Worshipped as a god. Of course, this meant that I could start filling in squares in other unclued entries, such as column 9 TE··· which gave TE·ET and matched up with f Something held. Not for the first time, I found myself going clockwise around the grid with 19ac Cut off retrospective music from Caribbean country for its citizens (6) for POLSKA being the last to be solved. The other unclued palindromic entries turned out to be REVIVER (clue a, Stimulant), STATS (b Numerical data) and MALAYALAM (d Language). Meanwhile the extra wordplay letters had been confusing me with its lack of a palindrome. But, eventually this was the eponymous failed attempt, and led to As I pee, sir, I see Eiffel the incorrect name for Pisa. The leaning tower could be found running NE–SW in the left half of the grid, although hopefully it will never reach the 45° angle it has here! A fairly speedy solve this week, but no less enjoyable for that. Thanks, Wiglaf. This entry was posted on 10 July 2015 at 4:00 pm	and is filed under Solving Blogs. You can follow any responses to this entry through the RSS 2.0 feed. You can leave a response, or trackback from your own site. Many thanks, Dave and Shirley, for the reviews.